I'm about to head off on a work and wine trip (yes, that's totally a thing), hitting up London, France and Spain - and I thought I'd share the four things that I'll be travelling with this Summer. PS. 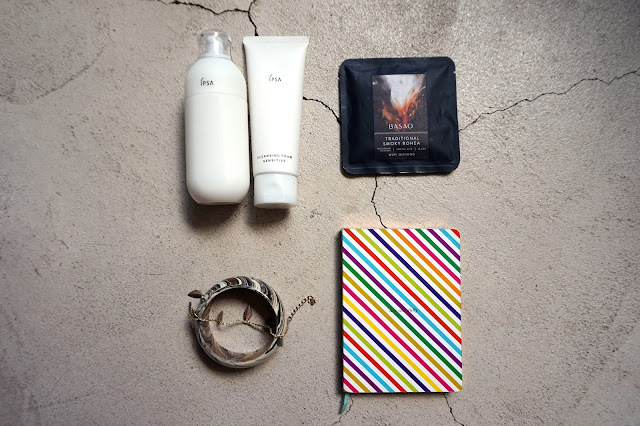 It's giveaway time - check out our free giveaway at the bottom of this post! I only recently discovered the skincare brand, IPSA, which produces a range of products specifically formulated for sensitive skin. The IPSA Cleansing Foam (HK$240) is anti-inflammatory and anti-bacterial, with wormwood extract to sooth easily irritated skin. It is initially applied almost like a clay mask (so expect to look like you smothered white clay on your skin), but the product dries clear after less than a minute. Much like the Dead Sea clay mask I adore, this cleansing foam leaves your skin feeling like you've peeled back an old layer of skin, leaving behind a fresh, new and vibrant glow. 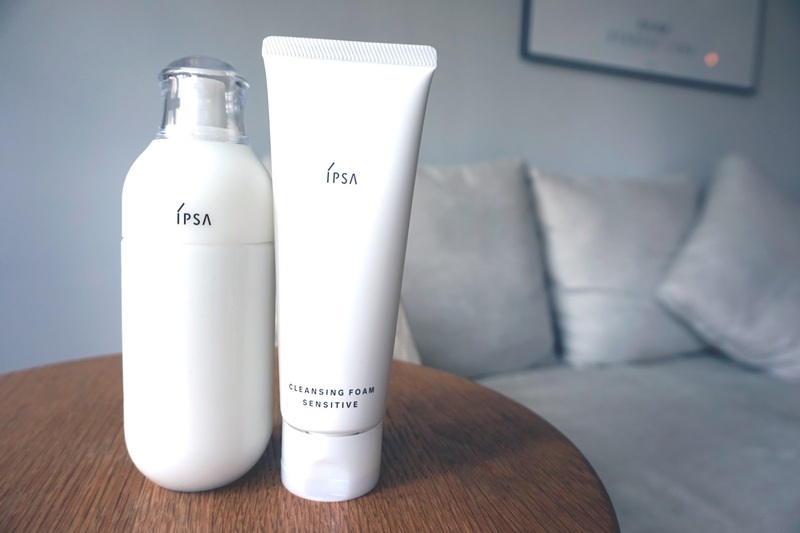 Surprisingly, unlike the clay mask I usually use, the IPSA Cleansing Foam never makes my skin feel tight or stings afterwards - probably due to the hyaluronic acid and acetyl barrier protection that stops moisture from being lost. The IPSA Metabolizer Sensitive (HK$520) is surprisingly lightweight, and is perfect for the Summer heat that leaves most of us with our moisturiser and makeup melting down our faces. With white nettle extract, the skin elasticity is strengthened without requiring a thick or heavy product, and acts as the perfect barrier to Hong Kong's crazy indoor aircon temperatures and outdoor pollution. We're not going to lie. We are a huge fan of INNRSTYL. We've raved before about their SVELTE work pants here, and their sneakers and trainers here, but they continued to blow us away with their grey SVELTE work pants - the perfect colour for a busy office professional to wear during the Summer! At only HK$442 each (and for those who are adventurous, they are also available in blue, burgandy, khaki, and orange - as well as the black we reviewed earlier), these are the perfect pants to wear onto the plane (so comfortable!!) when you know you need to head straight to the office or a meeting after you land. I've always been crazy jealous of people with cool looking headphones, especially on airplanes. They look like they don't have a care in the world - and with those headphones drowning out a lot of the external sound, they probably don't! For those who are looking for an affordable option, Brainwavz offers the HM2 Foldable Headphones for only US$49.50. The headphones are foldable (as the name suggests), and fits snuggly into an accompanying carry case. With adjustable cup lengths (I use the shortest possible one) and a lightweight frame, this is easy to carry around - and indeed, I like to go for a run with them on, and I'm able to use the volume slider control to easily adjust the volume of my music as I run. I was really distressed lately when I discovered that my teeth haven't been in the best shape, so I'm going to be taking good care of them this holiday (I mean, when I'm not busy drinking enamel-staining red wine in the vineyards of Bordeaux). I then came across Beverly Hills toothpaste: a brand that has roots in the oh-so-glamorous Beverly Hills (hello, 90210 anyone? ), but manufactured in Ireland. The toothpaste uses premium ingredients and spring water to produce toothpaste that offers customers safe and affordable teeth-whitening, all from the comfort of their own home. They have a HUGE range of different types of toothpaste to suit different people: ranging from Perfect White Gold (which has actual anti-bacterial gold particles in it! 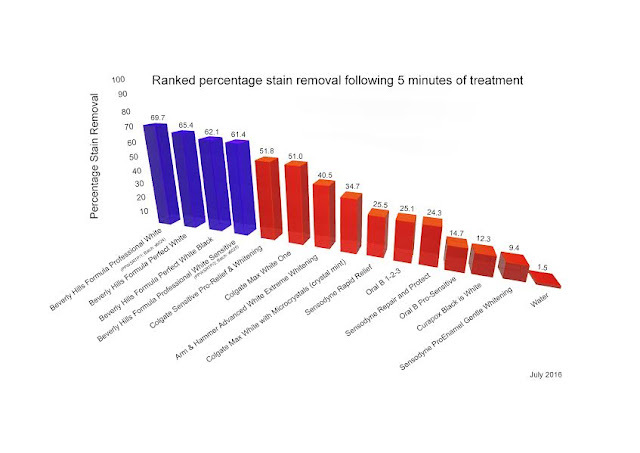 ), Perfect White Black (with activated charcoal in it, which traps chemicals and prevents their absorption, resulting in fewer stains, eliminating bacteria that causes bad breath), Perfect White Black Sensitive (for those with sensitive teeth), and Perfect White (with a dissolving Pentasodium Triphosphate agent that prevents food particles from settling on the teeth). 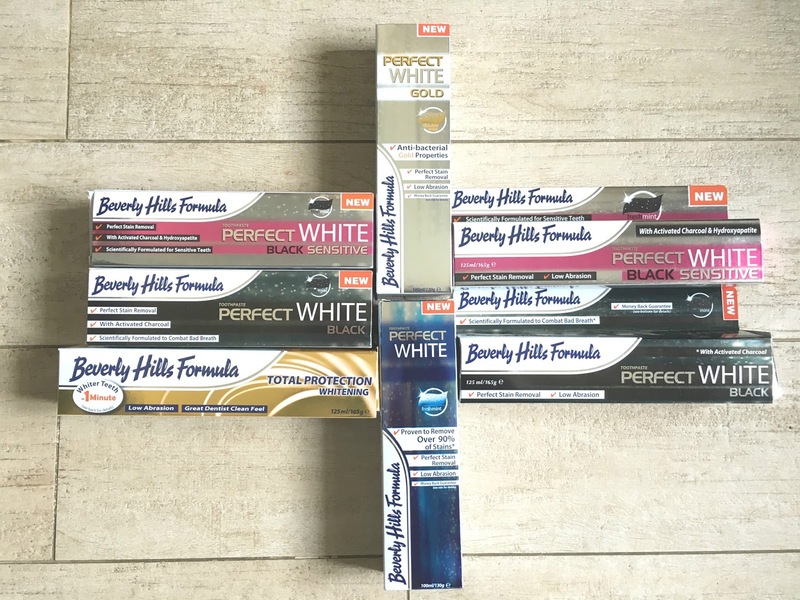 What has impressed me most about Beverly Hills Formula Toothpaste is that the brand has done its homework and actually tested its products against other brands. 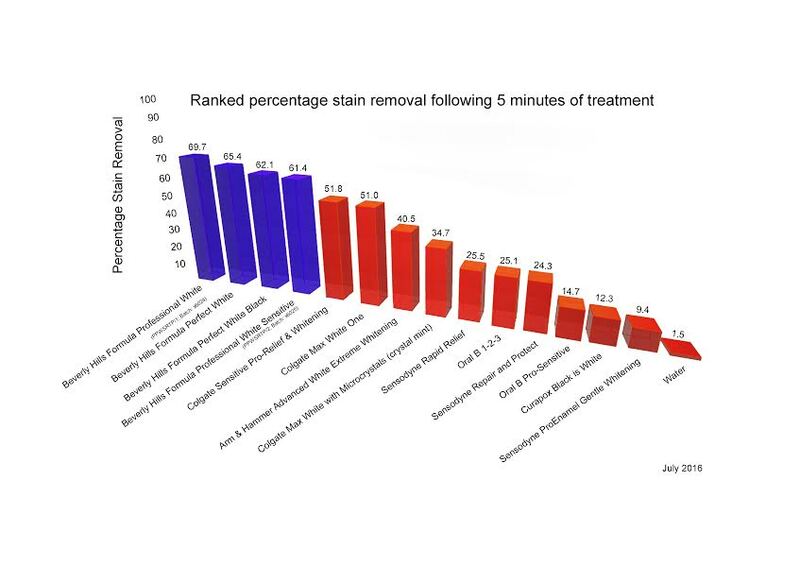 You can see from the chart below (provided by the company) that its products have been ranked over 60% effective in stain removal - which for at-home dental care is very high (usually you'd expect to see these figures for professional stain removal clinics) - and above their competitors. These products are available at Watsons in Hong Kong - but we are also giving away one box of Perfect White Black Sensitive and one box of Total Protection Whitening to one of our readers for free. All you need to do is like our page on Facebook - we'll pick a winner on 31 August and ship it to you internationally for free!